Love, love, love linen. Color is so rich. Perfect for my new color scheme. 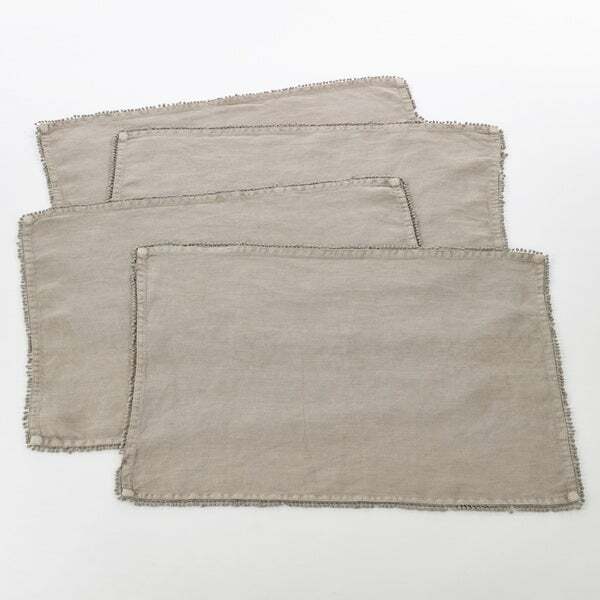 Available in beautiful, stone washed colors, these lovely Pom Pom Design Placemats are a wonderful choice for any table setting. They're easy to pair with both solid colors and patterns, so you can blend within existing décor. The border is crafted with small, subtle pom poms, which adds to their entertainment. Blue grey, ivory, natural, ocean blue, jasper green, midnight blue, purple, red, terracotta, celery, cream, lilac, lavender, olive, pumpkin and rose. Small, chic pom poms add a playful note. Made with 100% linen for an organic, natural look. Dimensions 20.0 In. X 14.0 In. X 1.0 In. Lovely material and beautiful color. Extremely happy with this purchase.